It’s seemingly inexplicable to many that one of the world’s top oil exporters won’t help its “ally” survive the ever-worsening fuel crisis, but upon closer consideration and after much-needed critical thinking, it becomes clear that Russia intends to politicize this crisis in order to compel Syria into undertaking further concessions related to the upcoming constitutional reform process and initiating Iran’s dignified but “phased withdrawal” from the country, meaning that Moscow probably won’t “ride to the rescue” until Damascus finally promises to do what it’s wanted for over the past two years already. The US’ strict anti-Iranian sanctions regime is responsible for causing a serious fuel crisis in Syria, with the popular Al-Masdar information outlet reporting that “thousands of cars in cities like Damascus, Latakia, and Aleppo are forced to wait several hours to fill up gas as the lines often stretch 3-5km long”. Neighboring Lebanon is temporarily assisting Syria with emergency fuel shipments in order to prevent the crisis in the war-torn state from worsening at precisely the point when most observers expected it to finally improve, but Beirut barely has enough oil to meet its own demands so this therefore doesn’t represent a sustainable solution to the crisis. As Syria struggles to survive and stave off the Color Revolution unrest that might “naturally” develop if its people continue to live in squalor and the price of everything spikes in response to shortage of fuel, the Alt-Media Community is busy condemning the US and its allies for their role in all of this while avoiding the elephant in the room of asking why the country’s oil-rich Russian “ally” isn’t helping it at this dire moment. It’s seemingly inexplicable that one of the world’s top oil exporters and most masterful perception management practitioners wouldn’t gift its “ally” emergency fuel shipments as a humanitarian gesture or at least sell it what it needs under a deferred payment plan, especially when considering that it’s owned all of the country’s oil and gas infrastructure since last year and regularly ships large amounts of oil to the country in order to meet the huge demands of its fuel-hungry Aerospace Forces there. On top of that, Russia even sells gas to its American adversary in spite of the sanctions that its customer imposed on this industry, proving that the “power of the dollar” is just as much of a Russian mantra as an American one, so it doesn’t make sense why it won’t do the same for its Syrian “ally” in exchange even if it’s through an oil-for-goods “barter agreement” like Russia has with Iran. Evidently, the Russian leadership is deliberately holding off on helping its Syrian “ally” for reasons that have nothing to do with economics but everything to do with politics. To explain, President Assad dealt his Russian counterpart an unprecedentedly humiliating diplomatic defeat when his government refused to implement the many controversial clauses of the Russian-written “draft constitution” that was first unveiled during the inaugural meeting of the Astana peace process back in January 2017, something that President Putin has never forgotten. Practically every one of the many growing differences between Russia and Syria can be traced back to that moment when Moscow caught Damascus completely off guard by presenting this surprise document to it at the same time as it gave this proposal to the so-called “rebels” that also attended the event, which was an unthinkable affront to Syria’s dignity and “face” even though it was “well-intended” and meant to revive the stalled peace process. 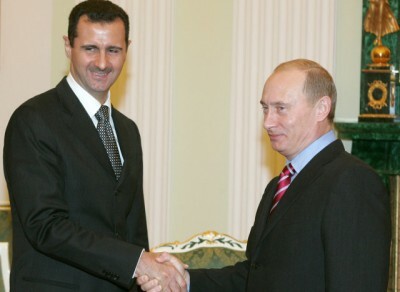 Worse still, Russia then began “gently” seeking Iran’s “phased withdrawal” from the Arab Republic and entered into open collaboration with Syria’s hated Zionist foe to this end, resulting in the “nightmare scenario” of “Putinyahu’s Rusrael” emerging on Damascus’ doorstep and even becoming the most powerful military force within its own borders. President Putin is so angry with President Assad ever since the September spy plane tragedy that he’s no longer on speaking terms with him anymore after talking to his counterpart only once nearly a full week after what happened, instead dispatching Defense Minister Shoigu to deliver a message to him recently when he could have just picked up the phone and called like he often does whenever he wants to talk with Erdogan or Netanyahu, both of whom it should be pointed out are Assad’s enemies. It can only be speculated what the latest message was about, but it wouldn’t be surprising if it included a “reminder” about President Putin’s insistence that his Syrian counterpart complies with the many constitutional changes that Russia “suggested” over two years ago and which are once again becoming relevant ahead of the commencement of the so-called “constitutional committee” that Moscow compelled Damascus to “compromise” on by agreeing to only have a 1/3 representation in. Had Damascus agreed to Moscow’s speculative demands, then there’s no doubt that Russia would have already “rode to the rescue” by now and saved it from the current fuel crisis, but it’s very likely that Syria refused to give in to this “diplomatic blackmail” and that’s why Russia is “punishing” it by withholding much-needed supplies at this crucial time despite knowing that the exacerbation of this crisis could very well lead to Color Revolution unrest. Unlike what many might think, that scenario wouldn’t necessarily be detrimental to Russia’s strategic interests since it’s already “grooming” several members of the Syrian “opposition” like Jamil Qadri who often meet with high-level diplomats in Moscow and could possibly replace him “if need be”. Furthermore, “Russia’s Reshaping Syria’s ‘Deep State’ In Its Own Image” by actively “reforming” its armed forces in order to eliminate Iranian influence and replace it with its own, so it’s not far-fetched to imagine that Moscow has several ” back-up plans” if President Assad doesn’t do what President Putin wants. Are The Saudis Pulling The Strings? Another fact that deserves mentioning is that Russia currently controls the global oil market through the OPEC+ duopoly that it jointly manages with its new Saudi strategic partner, which it’s bidding to build 16 nuclear reactors for and just delivered state-of-the-art rocket launchers to. The aforementioned shipment also occurred right around the time that Russia’s UN Ambassador praised the Saudi-led coalition for “playing a very constructive role” in Yemen and just prior to the news that Russia replaced Venezuelan and Iranian crude on European markets as a result of Trumps sanctions regimes against both of the country’s “partners”. Given the ultra-lucrative cooperation that Russia currently has with Saudi Arabia and the growing closeness between these two Great Powers, it’s very possible that Russia intends to also replace Iranian crude on the Syrian market as part of its regional “balancing” strategy and is just waiting for the fuel crisis to become so unbearable that Damascus ditches Tehran and practically begs Moscow for oil at any price, possibly after promising to implement Russia’s “proposed” constitutional “reforms” and initiate Iran’s dignified but “phased withdrawal” from the country. The entire population of Syria is seriously suffering from the current fuel crisis that was caused by American sanctions but could easily be relieved through the support of the country’s oil-rich Russian “ally”, though Moscow is holding off on helping Damascus until the latter complies with the Great Power’s most important political demands such as implementing the Russian-written “draft constitution” and initiating Iran’s dignified but “phased withdrawal” from the Arab Republic. The worsening crisis is making it more difficult for refugees to repatriate to their homeland from neighboring Lebanon and could also potentially result in a Color Revolution against President Assad, though Russia doesn’t seem to fazed by any of this because it already has several back-up plans that it could rely on in those scenarios in order to safeguard its strategic interests. After all, none other than Russian Foreign Minister Lavrov loudly proclaimed in 2016 that “Assad is not our ally” so it doesn’t matter to Moscow whether he remains in office or not. Alt-Media won’t admit it, but it looks like President Putin is no longer afraid of the “Assad must go” curse.